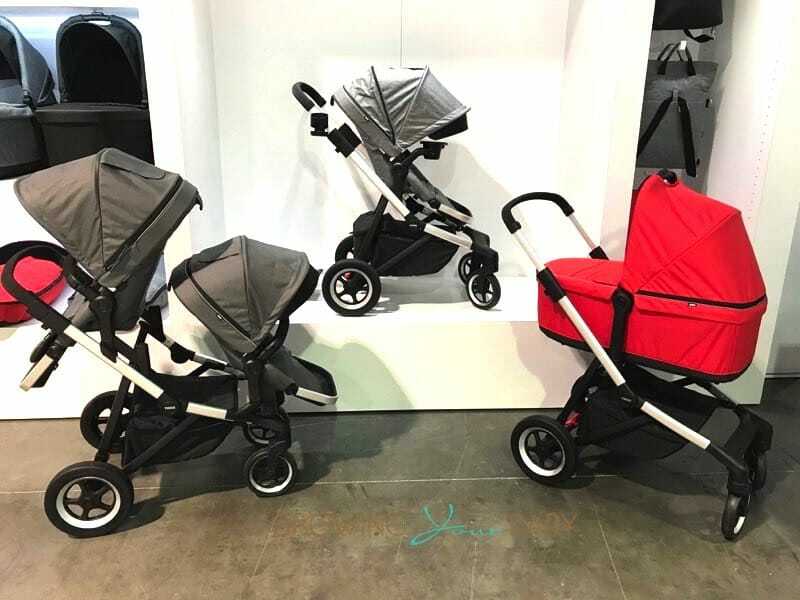 The stand n ride stroller has become popular in recent years because it is the perfect solution for parents who have 2 children of different ages. 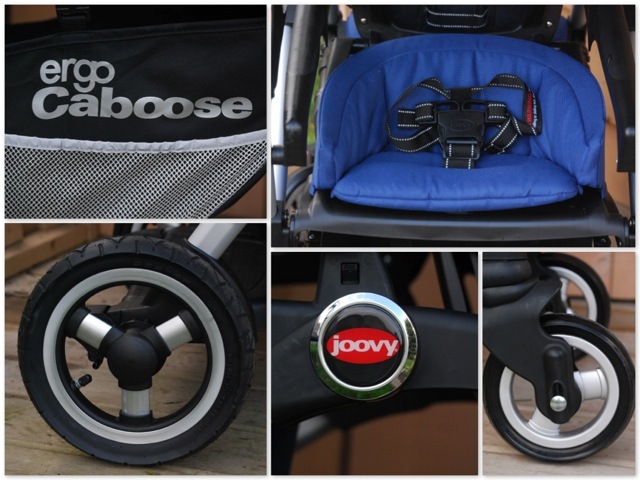 Years ago Joovy cornered the market when it introduced their Caboose stroller, a lightweight, practical, go everywhere stroller. Introduced in 2008 the Ergo caboose is the biggest of the ‘cabooses’ and also the most luxurious. 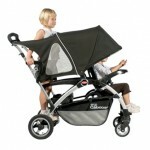 Equipped with a bigger canopy, this sleek stroller has a brushed silver frame and a smooth push. It can be used with either a toddler and a pre-schooler or an infant and a toddler (minimum age for the back seat is 2.5). Out of the box all that was needed for install was to pop on the 4 wheels and add the canopy. Perfect from birth, the Ergo comes with an attachment that allows new parents to also use it as a travel system. Unlike the caboose and the caboose ultralight, the infant seat attaches just under the front handle bars with a Universal Car Seat Adapter. This is nice because it allows parents to always have their new baby in sight, while giving an older brother or sister who may still be too young for the bench the front seat. For babies 6months+ the main seat features a 5-point harness, swing out snack tray and mesh cut out to allow air to flow nicely on hot days. 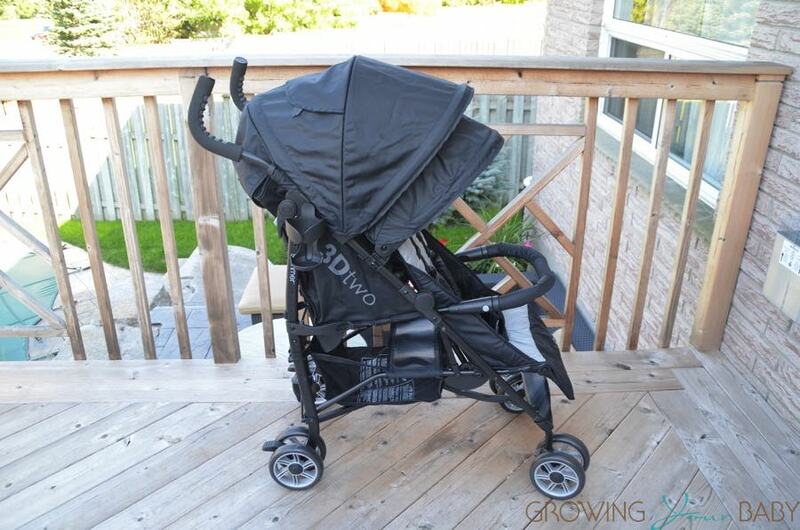 This spacious seat measures 14″ wide and an impressive 27″ from bum to the height of the canopy. While it does have a one-handed recline, it’s only about 45 degrees which is not enough to accommodate a sleeping baby. For the back rider, the seat is padded with a 3-point harness. Not designed to be a full time spot, this seat is also moulded to keep a little bum in place while strolling. Parents looking to add extra comfort to both seats can also purchase the optional deluxe seat kit. 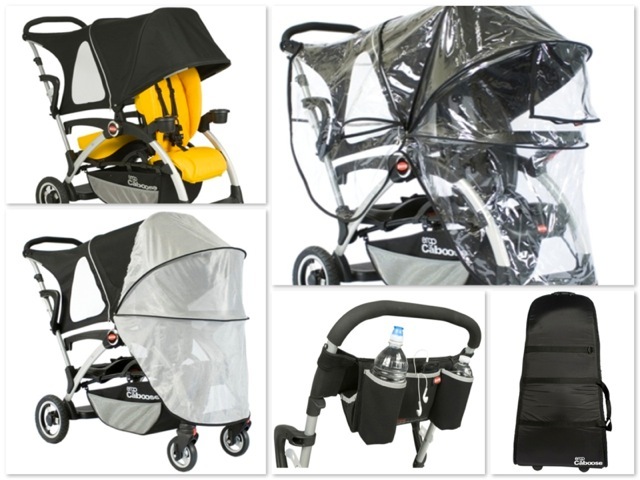 Perfect for the Winter, this padded set installs easily to add a nicer ride and a bit of style to your stroller. The front cover just slides over the seat to add some extra padding to the back, sides and base of the seat. 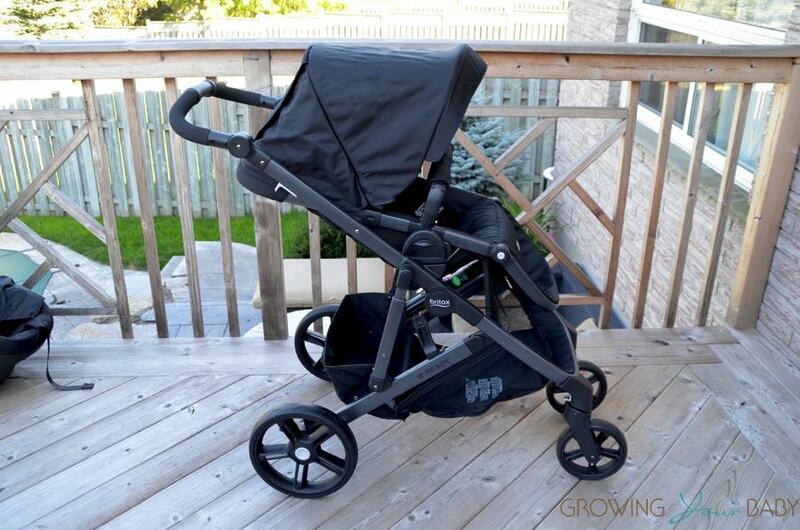 To install the bench cover you have to remove the original pad that comes with the stroller , re-route the straps through the cover and Velcro it in place. The canopy on the Ergo is not only spacious but it has ‘wings’ that attach to the side of the frame to block the sun for the second rider, while allowing air to flow through mesh panels on the side. One of the issues I found with the original Caboose was that when it was really sunny out, it was hard keep both boys shaded. The addition of this panel, which zips in easily, solves this problem. When my son is standing on the back board I unlatch the back canopy so it doesn’t get in his way. This canopy also is designed to be more rigid so it won’t blow backwards during a storm. 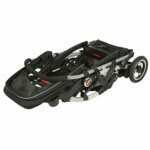 As with all Joovy strollers the storage on the Ergo is fabulous. 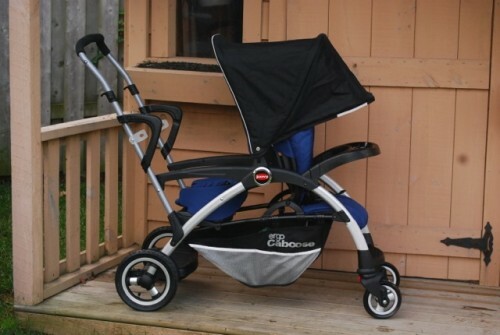 Stretching almost the length of the stroller, the basket is both structured and easy to access. The back bench can also be pivoted up to allow for storage of bigger items. Joovy has also added 2 velcro strips to the inside to conveniently hold the tire pump, which I LOVE because I never have one when I need it. There are also 2 mesh pockets to each side, which can hold easy to grab items like snacks, wipes or diapers. 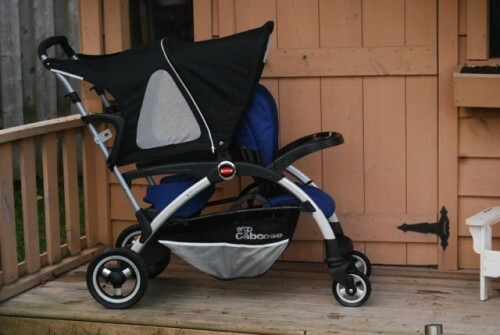 Another feature that sets the Ergo Caboose apart from the original Caboose is the wheels. Fully loaded with both boys in the stroller, the ride is smooth and effortless thanks to the new twin piston front wheel suspension. A set of 8″ inflatable wheels on the back ensures that you are able to make it over gravel, grass and uneven pavement. Easily collapsed with 2 levers on the handle bar, the Ergo locks shut with 2 clips on each site and can be transported using the ‘handles’ on either side of the frame. Folded, the Ergo is a bit long, but this can be reduced by removing the canopy or snack tray. Joovy also offers a travel bag if you would like to use it for traveling. Weighing in at 30lbs the Ergo is also a bit heavy, but definitely worth it. 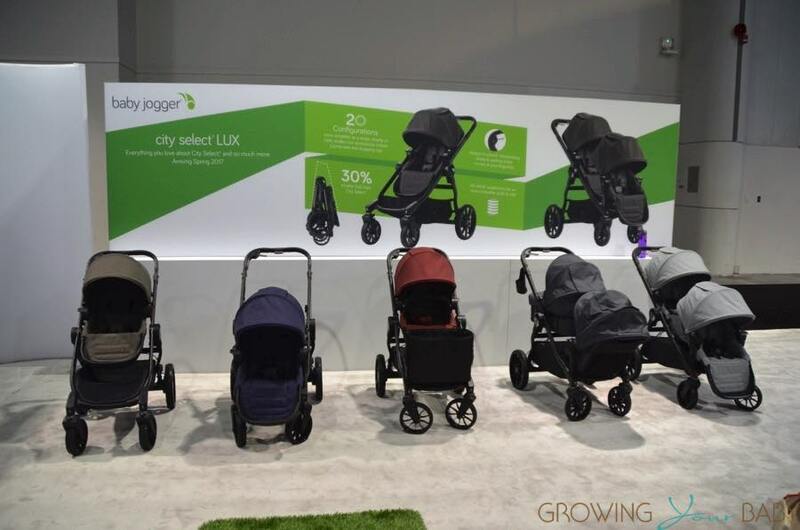 It is a strong stroller that has many features over it’s sister strollers, which makes it the perfect stroller for trips to the park, mall and school pick-up. I also noticed it to be one of the most popular strollers this Summer at the amusement parks and Zoo.